A starter to share or a starter of your own? It’s hard to resist a starter in an India curry house. Especially the crunchy popadam that comes with a range of chutneys. Mango, mint or mixed chutneys with crunchy popadams is a great way to start the tasty curry night and the conversations with your near and dear. A popadam with chutneys is just the start – you have so many varieties of starters that are sure going to make you enjoy the full flavours. The crunchy circular oil fried munching bits are the best way to start any curry night. Accompanied by mango or mint or hot chutneys, these will intensify our quest for spicy curries ahead. Popadams are made of variety of lentil flours and comes in many flavours and sizes. The main ingredient is Urid dal flour (black gram flour). The other varieties contain flours from chana dal (or split chickpeas), rice or even tapioca or potato. The flavours like ground black pepper, jeera, garlic, etc added to prepare many types of popadams. The common way of cooking a popadam is by frying, but roasting popadams is also popular. The best companions for a popadam are chutneys – mint, mango or mixed varieties. How British is Mulligatawny soup? As good as its name! But, it is originated in Madras region (now Chennai) during the British Raj times. The literal meaning when created was ‘black pepper flavoured water’ dish. Now it evolved as a creamy, thick and spicy soup that is filling and satisfying. Tikka has got two meanings – one literal meanig is ‘tiny portions’ or ‘bits to share’ and the other is ‘hot’ tasting, pronounced as ‘Thikka’. Chicken breast pieces are marinated in Indian spices mixed in yogurt and then cooked in a traditional ‘tandoor’ to get that smokey and slightly crunchy taste. In India it’s widely known as Tandoori chicken where whole or any portion of the chicken is prepared in a similar method. 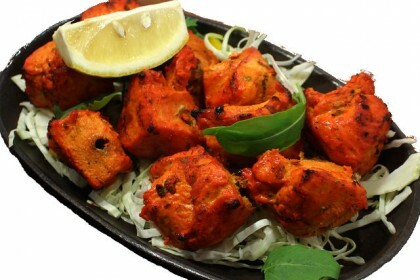 Chicken tikka in Britain is a popular starter. The main dish made out of chicken tikka called ‘chicken tikka masala’ is indeed our national dish! More about chicken tikka masala as a main here. Traditionally a kebab is a miced meat, seafood or vegetables marinated or mixed with spices and cooked over fire. ‘Seekh’ is skewer in Turkish and hence the lamb mince on the skewers cooked over fire is called a seekh kebab, a favourite starter of many curry lovers. Usually the seekh kebab is cooked in a tandoor (clay oven) for the authentic flavor. The spices mixed in the lamb mince generally include home made masala, chilli powder, coriander powder, etc. The word ‘kebab’ has its roots in middle east, probably Persian origin. Many authentic serve seekh kebabs with the skewers or some just the tandoor cooked kebabs for the convenience. If you love meat, especially lamb, don’t miss this tasty starter! ‘Prawn puri’ is a miniature of curry night, the cripsy puri topped with tasty and spicy prawns cooked in a mild tomato based sauce. 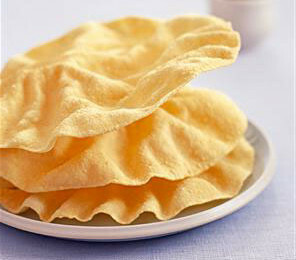 Puri is a type of Indian bread like chapati but fried in oil for a crunchy texture. This is a delicious starter that invites us to munch and await the rest of the curry night! 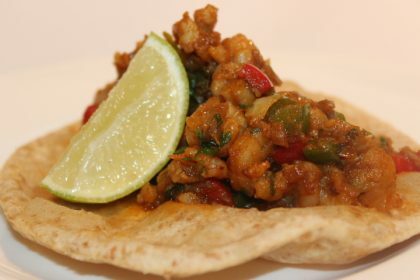 Prawn puri is essentially king prawns cooked in an exquisite mild sauce and placed over a crispy puri. This starter introduces us to the whole new world of Indian tastes. 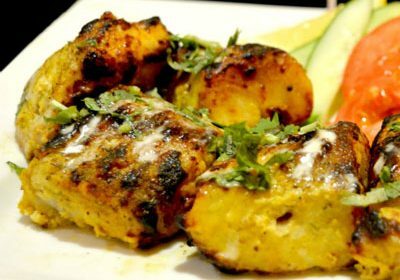 Paneer tikka is the alternative to chicken tikka for the vegetarians. Paneer is a sort of cheese freshly made by reducing the milk using sour agent such as lime or lemon juice or vinegar. 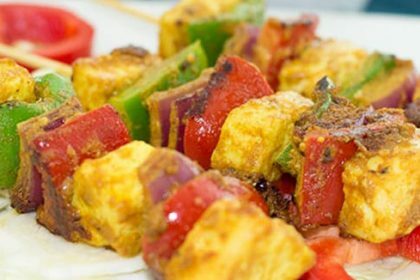 Square pieces of paneer are marinated in Indian spices and grilled in a tandoor using skewers. Adding chunks of peppers and onions is also common in a typical paneer tikka. Enjoy this paneer tikka as a starter in your curry night, it will be a great addition to your curry night experience. Typically a samosa is a vegetarian starter in the curry houses, but it’s becoming ever popular as a snack in the house holds of Britain. It’s a better choice over the sweets to offer as a birthday treat to the colleagues at work place! 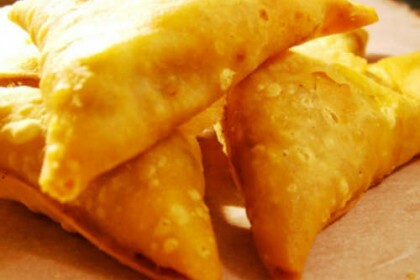 Generally samosa is a trapezoidal or triangular shaped pastry filled with various savory items, like mashed potato, chicken or lamb mince with spices and either deep fried or baked. Very popular snack all around the world, particularly in Indian subcontinent and the middle east. When you order samosa as a starter, ask for the chutneys to accompany – making it a a finger licking starter combination. More about samosa here. Shashlik is a great sizzling starter that surely turns the heads around you when your order comes to the table! It should not be confused with seekh kebab, listed above. 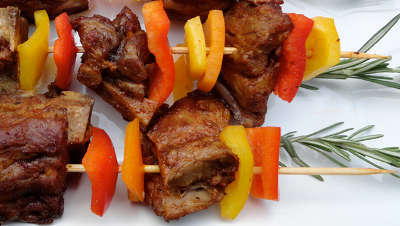 Meat cubes are skewered in shashlik where as mince meat is used in seekh kebabs. Lamb pieces are marinated in curry spices, yogurt and then grilled in a tandoor or ‘mangal’ (a portable barbecue tray). It’s also common to add vegetable pieces like mushrooms, bell peppers and onions in between the meat cubes. Shashlik is an another favourite starter that typically served on a wooden board with a hint of salad and a sauce. You can ask for a chicken or vegetarian version of shashlik, if you prefer. Chaat or chat is a celebrated street food in south east Asia found in many bazaars or busy market streets enjoyed by thousands everyday. Any good curry house in the UK serves chaat as a starter to bring the road-side food experience to our curry world. Originated in north Indian states, chaat is sold by small vendors on their food carts complimented with various homemade chutneys. The literal meaning of chaat is ‘to taste’ or ‘to lick’ in Hindi language. Although chaat is a mixture of many fried, spiced snack items, the main ingredient is besan (gram flour or chickpea flour). Also many fresh ingredients like finely chopped coriander, onions, green chillies, a dash of yogurt added and served with chutneys. 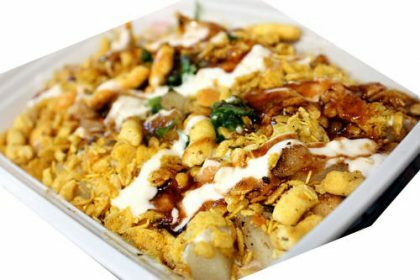 There are many types of chaat items that also include other ingredients like potato, rice flakes, bhel puri, paneer, etc. Another popular vegetarian starter that is enjoyed by millions every day in the sub-continent and world over. 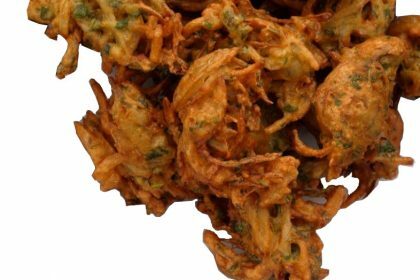 Onion Bhaji is a type of Pakora and widely offered in the restaurants and takeaways here in Britain as a starter. Made from the gram flour, onions, fresh and dried spices, this melt in the mouth snack is a fabulous starter for those who love crunchy and slightly spiced starters. A must have street food in many road side shops metro cities in India like Mumbai, Delhi, Kolkata. Also served freshly cooked in street shops called tapris or highway eateries known as Dhabhas. The addition of cumin seeds, a bit of corn flour gives good texture and taste to this fritter like starter fried in sunflower oil or other cooking oils. Onion Bhai or pakora have a great place in the times of mansoon with chai or tea or coffee with friends and family while having a good conversation. If you are a fishetarian or prefer seafood, there are a few starter dishes you will enjoy in your curry night. 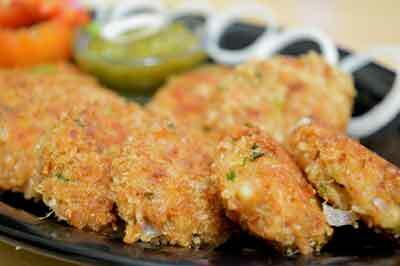 Fish cutlets are made with steamed fish mince, boiled potatoes, aromatic spices and fresh herbs. Generally accompanied by chutneys and salads. Tasty and healthy option. 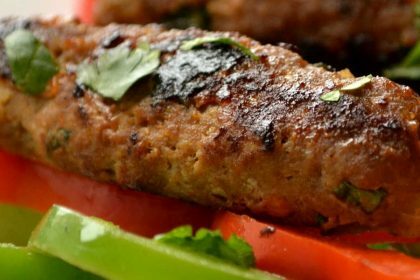 Nargis kebab or kofta is a starter named after an Indian flower because of its appearance. 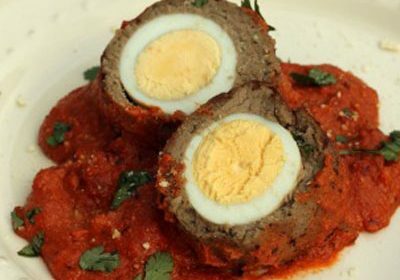 In fact it is the Indian version of ‘Scottish egg’, but the minced meat around the boiled egg is mixed with spices like coriander powder, cloves, and some fresh herbs. Lamb mince covered boiled egg served with tamarind sauce or mint or other chutneys. Chunky fish pieces, preferably monkfish, marinated in tikka spice mix and yogurt then cooked in a tandoor. Aromatic and feelgood starter enjoyed with a dash of chutney and salad. This dish is as popular in India as in Britain. Whole pomfret fish is marinated in colorful tikka paste and cooked in traditional tandoors in Mumbai and served as a main course. A brilliant fish dish that gives your taste buds a treat! Want to know about more starters that are not listed here? Please contact us. Your views and suggestions are important to us!